Looking for an affordable tree service company in Las Vegas? Of course you are! That’s why you’re here! Welcome to Las Vegas Tree Trimmers! ​So.... What’s the reason for your visit? Tree removal? Maybe some tree trimming? Or perhaps you just need to clean up that backyard and get rid of all those unwanted branches, trees, and stomps. If it’s anything tree related, we can help! Want To Take Back Control Of Your Home? We Can Help! Of course we do all the other tree services like stump grinding, tree pruning, recycling wood and debris as well. Just let us know what you’re looking for and we can help. Now... I’m sure you’ve noticed that all of these Las Vegas tree service companies are saying the same thing. ​“We’re the best!”, “We’re the most affordable!”, “We’ve been doing this 100 years!”. So how do you know what company to go with!?!? Then click on the phone number below and give us a call to schedule a FREE Estimate. Either Debbie or Walt will be on the other line. You’ll like them. Super friendly and informative about tree service. We’re very excited to prove to you why we’re the most affordable tree service in Las Vegas. We’ve been in the tree business for over 3 decades and take great pride in serving the good people of Henderson, North Las Vegas, Summerlin, Arden, and the nearby Las Vegas, NV metro area. Most people don’t know that there's a ANSI standard to the quality of work being provided with tree service. Some company don’t comply with these standards. With Las Vegas Tree Trimmers, you can be sure that all of our contractors live up to the ANSI standards for tree trimming, pruning, and cutting. We also stand behind our work with our 100% Satisfaction Guarantee! Find out more about our tree service guarantee. ​For more information about tree trimming las vegas, click on link. Tree pruning refers to the maintenance of the aesthetic appeal of a tree. Pruning could be done in different ways such as taking out ugly branches, thinning the crown, crown reduction, removing lower branches, and shaping the tree for design purposes. To maintain the visual artistry of the tree, diseased or damaged branches must be taken out. A lower branch that may cause obstruction also needs to be pruned. The unwanted branches must be pruned in a manner that the stem or the trunk is protected. To protect the stem as well as the other branches, all pruning cuts should be done on the branch side of the stem collar. Doing so also allows the tree to heal faster after pruning. Thinning the crown refers to reducing the density of the branches to allow new branches to grow and permit better air circulation. Crown reduction refers to the method used to reduce the height of the tree by reducing the canopy. Tree pruning must be done during the dormant period as it lessens the risk of fungus infection or insect infestation. Pruning actually protects the tree against fungus because of proper air circulation. 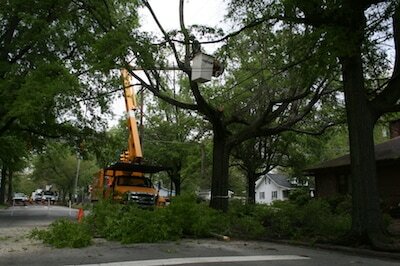 Pruning the tree on a regular basis minimizes the risks on properties that may be caused by falling tree branches. Despite the myriad of benefits a tree can give to mankind, there will always come a time when it becomes a liability and needs to be removed. Tree removal may be considered if certain trees are no longer nice to look at, crowding a property, dying or posing a hazard to people or property and already needs to be cut down and removed. However, prior to tree removal, a professional tree worker or an arborist needs to assess the tree if it needs to be removed or just pruned. If the risk assessment unveils potential issues, like if the tree is already dying and there’s no way of recuperating, then tree removal may be the only solution to the problem. The process of removing a tree may vary depending on the size of the tree and its surroundings. Important factors must be considered before the tree removal procedure such as: are there utility wires within the vicinity? Will removing the tree affect nearby structures, other trees, or buildings? Removing a tree near a city park or a residential area may require a simple procedure but those near commercial areas and buildings may call for complicated procedures to get the job done efficiently. For more questions about tree removal las vegas, click on the link. 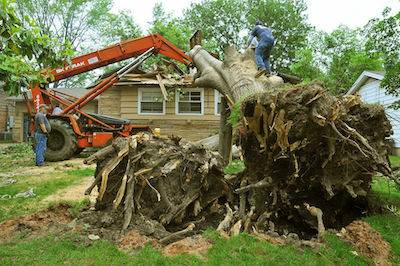 Some tree stumps could be hazardous to your home or business. Cracking open pipes and causing all sorts of damage. It’s important to remove these stumps as soon as possible. This could be a very dangerous task if left in the wrong hands. Plus you could be coming out of pocket for damages if the company you choose doesn't have the proper insurance. Make sure the company you choose is well experienced and covered with general liability and workers compensation insurance. Las Vegas Tree Trimmers is covered and has over 30 years of experience. Check out our stump removal las vegas page for more information. ​Stump grinding is the method applied when removing tree stumps with a stump cutter that uses rotating cutting blades to chip away wood. It is usually done to maintain the artistic value of a landscape. Stump grinding only removes the stump above the ground leaving the lower grade stump and the roots to decompose below the surface. Stump grinding is considered the best solution to remove tree stumps especially those in the lawn areas. While the process is expected to produce a considerable amount of mulch and soil, no worries as these byproducts of stump grinding can be utilized to backfill the hole or left on site to settle over time. It’s important to maintain our trees for a variety of different reasons. Not only for the appearance but also for health and safety too. Keeping your trees maintained will help keep your property value high and also give a very attractive appearance. But more importantly, If you don’t maintain your trees, you could risks your trees catching and spreading diseases or possibly creating safety hazards. Check out our tree maintenance las vegas page for more information. YES!! Of course! This is by far the most important question you can ask any tree service company. For one, operating a tree service company without a license is illegal. And second, if you decided to go that route because it might be cheaper, than you run the risk of covering any damages that we’re made by the inexperienced workers you hired. All of our workers have liability insurance, which guarantees that if the company causes damage to your home or possessions, then it’s covered. Yes, of course. We are more than happy to provide you with a list of previous jobs we have done. Even some jobs that are similar to your project. Just ask and you shall receive. We alway love proving why we are Las Vegas Best Tree Service. Well… Of course!! We will come out and do a FREE detailed estimate on the entire cost of the project and also give you a time frame that it will take. This is very important for some companies, a project might take them 3 days and others 3 weeks! Are their any hidden fees that I need to worry about? Great question! Most companies don’t mention the extra fee like stump grinding for example, and surprise with a bill that’s way off the estimate they gave you. With Las Vegas Tree Service, the estimator will give an individual price of each requested item/task, adds it all up, and then offers a discount of the total cost of the project. For cash paying customers, we offer an even greater discount. What type of equipment are you going to be using? Well this really depends on the project. It’s very important that you communicate with us on exactly what you need done to the best of your ability. We will then be able to determine what equipment we are going to need. It’s also very important to explain any obstacles that might prevent us from being able to use our equipment. Why yes of course. Everyone on my teams has been in this business for over a decade at least. I myself have been doing this for over 3 decades. Experience is very important when it comes to safety for you, your home, and ourselves. Give us a call at (702) 793-2711 to schedule a free quote. If email works better, please submit a form half away up this page. P.S. - Fill free to contact us anytime, day or night. Commercial or residential; homeowner, hotel, apartment complex - doesn't matter. The hard-working people and businesses of Las Vegas, Nevada call us to trim their trees, remove their stumps, and cleanup their landscapes... and that's because, with us? There's no mess, no stress, we're fast and flawless. What Our Client's Are Saying..
" We have been using Las Vegas Tree Trimmers since we moved into our home last year. The owners before us never kept up with their landscape. We found LVTT online and they came out and did a free estimate. The price was right in our budget and they did an amazing job. We didn't even recognize our home when they were finished. 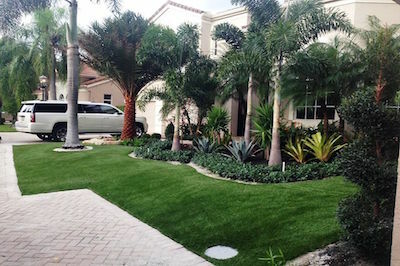 Highly recommend them to all our friends and family and they continue to maintain our lawn till this day."